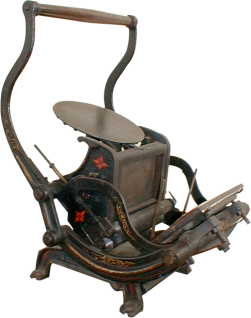 Uncle Sam’s inventor and manufacturer was William C. Evans of Philadelphia, advertising his various presses in Harper’s and Leslie’s in the late 1870s. (Evans was a man of many occupations; at various times he also sold real estate and pianos.) He patented the press movement in 1875, and started advertising the Uncle Sam in 1876 in 3 sizes: No. 1, nominally 1-1/4×2-3/4; No 2, 3-1/4×5-1/4 (also called 3-1/2×6); and in 1878 another No.2 of 5×8. They were either hand- or self-inking presses. The Uncle Sam No.2, above, with the unusual chase size of 4 1/2″ by 7 3/8″, has a patent date cast into its side that reads November 2, 1875.